Milan Baranyk was on target for Phantoms against Swindon. Peterborough Phantoms went on a late goalscoring spree to shrug off Swindon and continue their fine start to the English Premier League season last night (October 4). The city side struck four times in less than seven minutes during the third period to seal a 6-1 success at Planet Ice which was considerably more hard-fought than the final scoreline might suggest. Ales Padelek scored for Phantoms against Swindon. 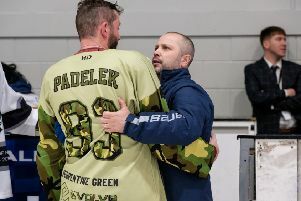 Import forwards Ales Padelek, Milan Baranyk and Darius Pliskauskas, and man-of-the-match Edgars Bebris, provided the late bombardment that blew away the Wildcats. It means Phantoms are one of three teams locked together at the head of EPL affairs. Milton Keynes and Basingstoke have also amassed 12 points to date. Phantoms coach Slava Koulikov said: “It was a scrappy game for a long time. It is difficult to know whether we weren’t quite at our best or whether Swindon caused that. “But in the final period it changed and we kicked on to win the game in good style. “Every result is important regardless of the scoreline, but I’m absolutely delighted to put on a show for our fans by scoring a few goals. Will Weldon provided an early breakthrough for Phantoms but Swindon import Sami Ryhanen restored parity later in the first period. Baranyk restored the home advantage in the second session, but it wasn’t until deep into the third period that Phantoms really escaped the Swindon shackles. A Padelek strike launched a late onslaught with Baranyk and Pliskauskas then striking just 37 seconds apart before Bebris brought up the half-dozen. putting the puck in the net. Phantoms are back in action at the weekend with a trip to Manchester Phoenix on Saturday (October 10) ahead of a home date against Basingstoke the following night.